Argentina Discovery - The 10 Most Popular Posts on Argentina Photo Gallery in November 2015. 1.- The Los Alerces National Park boasts lovely and simultaneously protects forests of ancient larches. 2.- Yabotí Biosphere Reserve, missionary natural heritage. 3.- Recovery Center and Breeding Bird Endangered Guira Oga, in the heart of the missionary forest. 4.- The "Cañadón de Profundidad" Provincial Park and the captivating atmosphere of the jungles of Urunday. The "Cañadón de Profundidad", located about 30 kilometers from the capital of the province of Misiones, the city of Posadas, Provincial Park was created in order to have an area for education and recreation, in the vicinity of the former city, and therefore only represents a small sample of beautiful and captivating environment Urunday jungles, although it has a total area of 19 hectares. 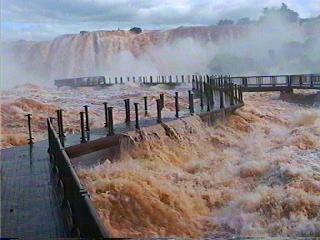 5.- The Yacuy Provincial Park is a protected natural area in the province of Misiones. 6.- The 10 Most Popular Posts on Argentina Photo Gallery in July 2015. 7.- Science and technology in Argentina. 8.- The Chaco National Park is a national park of Argentina, located in the province of Chaco. 9.- Summer holiday destination for millions of Argentines, the Atlantic coast has some excellent beach resorts. Today, there have been 23 visitors (118 hits) on this page!